Super Mario Galaxy 2(SMG2) was developed by Nintendo EAD Tokyo, and published by Nintendo. 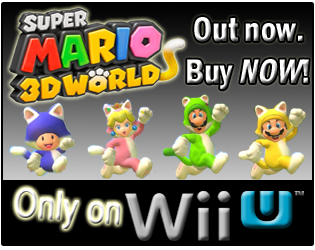 It was released on May 23 this year, with an MSRP of $49.99. Super Mario Galaxy 2 was rated "E" for "Everyone" by the ESRB, with "Mild Cartoon Violence" being the only "Content" listed for parents to be aware of in the game. 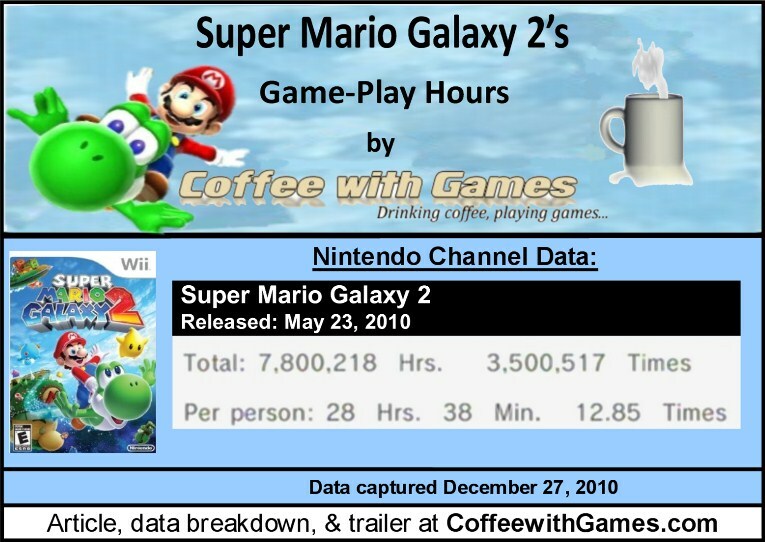 We last looked at Super Mario Galaxy 2's game-play hours from what they were reported as on October 4. You can look at the report HERE. 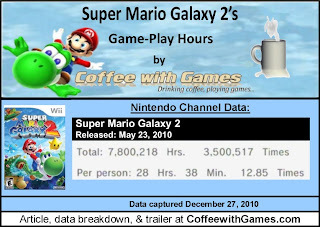 How many more hours have Wii owners spent playing Super Mario Galaxy 2, in the 85 days from October 4, 2010 to December 27, 2010? Let's take a look! Super Mario Galaxy 2 now has 272,413 Wii owners reporting their game-play hours through the Wii's Nintendo Channel. Super Mario Galaxy 2 has seen an increase of about 76,156 gamers reporting play-time data, since the data was recorded on October 4. Super Mario Galaxy 2 now has 7,800,218 Total Hours of game-play reported, an increase of 2,654,327 Total Hours since the last report. SMG2's average play-time is 28 Hours 38 Minutes "Per person" reporting data, an increase of 2 Hours 24 Minutes on the average reported "Per person" since October 4. The average play-time per session for Super Mario Galaxy 2 is just over 2 Hours 13 Minutes. Super Mario Galaxy 2's review score average is 97.07%, based on 53 "professional" reviews on GameRankings.com. Review score averages recorded on January 1, 2011 around 12:05PM. Super Mario Galaxy 2's Amazon.com sale rank is #40, and it is currently selling for $39.99. Sale rank and advertised price recorded on January 1, 2011 around 12:05PM. I still haven't played Super Mario Galaxy 2, but when I was uploading the trailer for this post, watching it really did make me want to play the game. 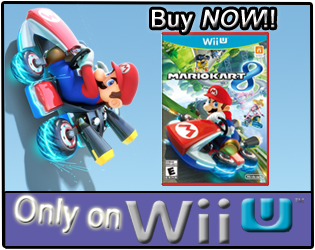 Super Mario Galaxy 2 was the Wii's best title released in 2010, according to the "professional" review score average on GameRankings.com. Super Mario Galaxy 2's "professional" review score average makes it the second best Wii game, only behind the original Super Mario Galaxy. I think it's interesting seeing that Super Mario Galaxy 2's sales rank on Amazon.com is #40; compared to New Super Mario Bros. Wii's sales rank on Amazon.com being #16. I think Super Mario Galaxy 2's reported game-play hours are solid, but the average hours "Per person" are lower than I was expecting for the game at this point. I'm not sure how many hours Super Mario Galaxy 2 takes to complete, but the average hours "Per person" are increasing slowly, and not increasing like I would expect them to if gamers were playing the game more than once. If you have played and beaten Super Mario Galaxy 2, how many hours did it take you to complete just the game's main story? If you went back to collect all the stars, how many extra hours did you play?